I can’t say my first intentional experience with Oklahoma’s Trae Young was as uninterruptedly studious as I would have liked. My face was thawing after shoveling snow in the frigid Iowa afternoon. My nearly-10-month-old son was bouncing, cackling at unintelligible noises I made in attempts to distract him from the teething pain that’s turned our house upside down the past couple days. In the middle of the chaos was my Samsung TV, mounted to the wall above a gas fireplace that doesn’t work, presenting Trae Young to me in all his evolutionary glory. Young is a 6’2” point guard from Norman, Oklahoma. He just turned 19 a few months ago and has a wispy moustache and hair that makes me think he could be Persian. Or maybe Native American or Indian or Filipino. I can almost picture him astride a horse, speeding across the Norman prairies and parking lots, thinnish hair whipping in the Norman wind, on his way to a game. He’s flirting with a unibrow and while he has a slight build, his shoulders are square and look prepared to carry more muscle and mass. Conventionally speaking, he doesn’t look the part though “the part,” as embodied by Michael Jordan, Shaquille O’Neal, Tim Duncan, or LeBron James, is being rewritten by two-time-MVP and two-time-NBA Champion, Stephen Curry who happens to be the stylistic predecessor to Young. LaMelo Ball isn’t alone in seeing something in Curry that could be applied to his own game. About a month ago, I attended a high school basketball game in Des Moines, Iowa. For someone who hasn’t attended a high school game in over a decade, the experience of merely walking into the building and being swallowed by giddy teenage energy is one of adjustment. I packed into the doors of North High School with the rest of the human cattle being corralled towards concessions and the gym. If you’ve been away for a while, it’s disorienting to see a mass of teens from a 37-year-old’s eyes and see your former self moving through those crowds in complete normalcy. North’s point guard and their main attraction is a smallish 5’10”, 170lbs junior named Tyreke Locure who looks to be taller than his listed height due to a dyed bushy faux hawk – similar to LaMelo’s. He’s a mid-to-low D1 prospect who posted 56 points on 33 shots just a couple weeks after I saw him. In the game I attended, Locure and his North teammates exhibited a trigger-happy penchant for chucking deep threes. In my most Chuck-ish, I found myself criticizing the game plan until those bombs started falling – which probably says something about my commitment to a strategy. Collectively, they were quick to pass up half-court opportunities in exchange for deep, often contested, threes. Locure’s game did not appear to be defined by hash mark threes. I saw him looking for the small spaces to let fly, but within that were probing drives, dump-offs, and floaters, but the Curry influence was evident. With North, I find myself needing to justify their liberal bombs by pointing to their success. Under their current coach, Chad Ryan, and with Locure as starting point guard in 16-17, they made the state tournament for the first time since 1991. MaxPreps currently has them ranked 7th in the state. The approach is working. And where instinct pushes me to find justification, intellect tells me question instinct. This is probably where my conventional way of thinking, some inner-Barkley, is running into my embrace of revolution, my inner-Curry/Steve Kerr. 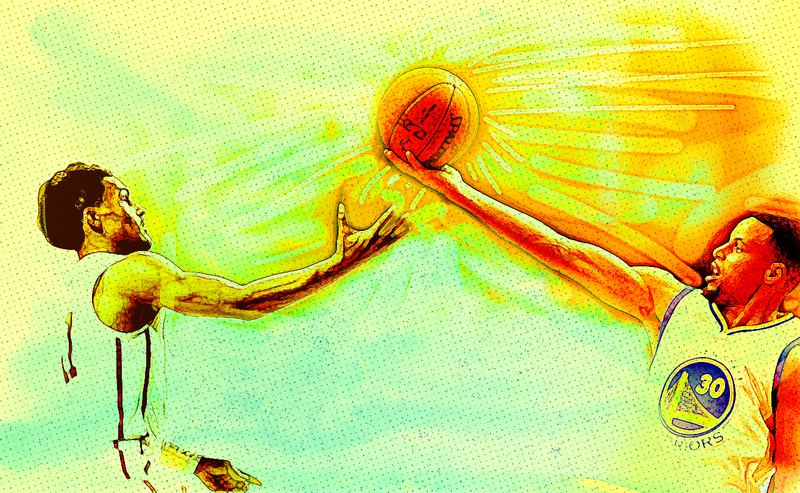 Locure and Ball represent different points on a spectrum of who and how Curry has influenced a culture of ballplayers. Ball is probably at the most polarizing end of the spectrum. A kid whose game built on the notoriety that comes with being something of a Curry-clone – though that’s unlikely how he views himself. Maybe some of that is unfairly worded by confusing the son for the father. 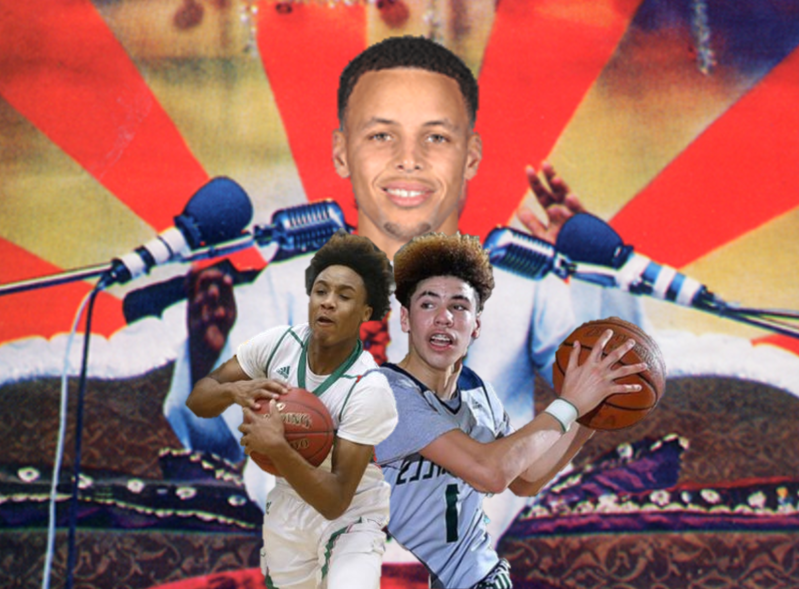 Locure and his North teammates, by contrast, have had the game opened by a combination of their abilities, their coaching, and (I’m mildly confident in this assumption) by Steph Curry whose influence has become omnipresent – from the California coast and the Hills of Chino to the tornado alleys of Oklahoma to the cold December gyms of Des Moines and a billion Instagram clips in between. That is the key word—comfort. When something is new, it feels uncomfortable. Despite the fact that the three-point shot has been in the NBA since 1979, it never became a real weapon until the last decade, and even that is stretching it. Why? Coaches were never comfortable with it. We can always work it closer to the basket, went the thinking. But once Curry demonstrated that he could make the looooong ones, Steve Kerr did grow comfortable with it, and “four-pointers”–those long-range bombs that demoralize opponents to the point that they seem to be worth an extra point–became a big part of the Warriors’ offense … not to mention a big part of the NBA’s entertainment package. It’s unfair to seek out the Next Curry in every long-distance shooting teenager just like was unfair to label every dunking shooting guard as the “Next MJ.” Instead of seeking out the Next Anyone, it’s more accurate to identify the traits of iconic players in the next generation and establish a stylistic family tree of sorts. In terms of a basketball lineage, Ball and Locure are inheriting some of the stylistic genes of Curry. As kids who aren’t yet of voting age, how their futures map out are wildly variable, but in each, the fingerprints of Curry are visible. 14 assists is nice and all, but Young easily could’ve had more. He frequently found open teammates both under the hoop and along the perimeter. They made plenty, but missed some gimmes too. That they were so open is testament to Young’s playmaking and vision, his teammates shot making (and occasional shot missing), and coach Lon Kruger’s pro style deployment of personnel around the perimeter. Young frequently had release valves in the corners that he didn’t have to look for; he knew they were there. He had full court assists, no-look wrap around passes, jump passes off slaloms to the rim. More often than not, he made the right decisions. 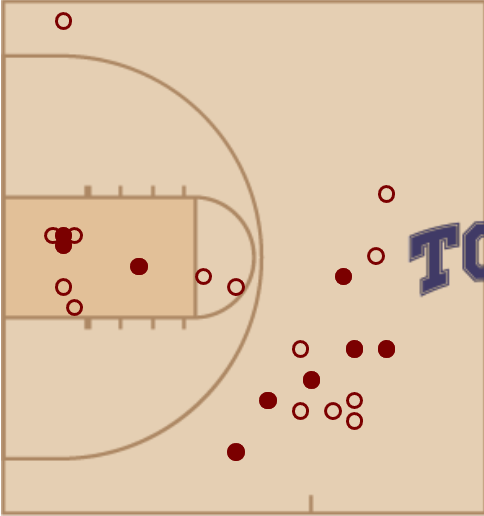 And while the 3-7 in the paint and seven turnovers look ugly, the indefatigable pressure he put on the TCU defense was more than worth the trade off to a teammate or alternative pace of attack. The game was ultra-high pressure, decided by a single point, and yet Young played the entirety of the second half and only sat two minutes all game. The passing and driving are great, even titillating, but his range and shot release time are where the Curry comparisons become inescapable. I have no idea exactly how accurate the shot chart below is in terms of distance, but it’s accurate in the sense that the distances match up with what I witnessed. There are tracking systems that can tell us how close defenders were, but from my distracted viewing, a couple of those bombs were with defenders in his space, but unexpectant. By the time the defender realized what was happening, Young was already too deep into his motion with a release they couldn’t catch up to. Like Curry, or any deep shooter, this ability opens up mega avenues for penetration. I don’t know if people look for the “Next” because we’re lazy or have bad habits or because we see points of reference in players. Maybe it’s the never-ending quest for immortality through progeny. Penny was the Next Magic. Eddy Curry was the Next Shaq. Harold Miner was literally Baby Jordan. The excitement I felt watching Trae Young wasn’t in seeing the Next Steph Curry, but seeing the possible evolution of what Curry has brought to basketball. I caught just a glimpse, the kind of glimpse that people turn into Loch Ness Monsters and UFOs and Yetis. Maybe it was just a tease and Young is more Jimmer than Steph. Or maybe it’s the next evolutionary step in audacious offense. I wouldn’t say I’ve seen the future, but I’ve seen Steph Curry and I’ve seen Trae Young and I’m good with that.